We recently Inspected two unsealed roads in country Victoria that were treated with PolyCom Stabilising Aid by a Council 15 months ago. After 15 Months with zero maintenance, both roads remain smooth, tightly-bound and free of potholes and well within acceptable standards. 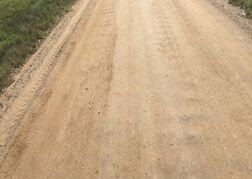 Both of these roads required Maintenance Grading on average every 3 to 4 months prior to being PolyCom treated. The need for maintenance has been reduced considerably, which saves the council time and money. It also means less calls from residents complaining about the state of their unsealed roads! PolyCom is Produced in South Australia and provides an economical, safe solution to an age old problem of unsealed road maintenance efficiency. Contact us to learn how PolyCom can work for you.